Known as a family playground, Lake Tahoe is a fun mountain town that provides virtually limitless things to do. Situated in the heart of the Sierra Nevada Mountain Range at an altitude of over 6,000 feet and bordering Northern California and Nevada, people from all around, both young and old, make the expedition to Tahoe to enjoy its recreational and entertainment attributes throughout the year, with various activities changing with the seasons. There are many characteristics that Lake Tahoe is known for, two of which are its inherent beauty and that it is home to one of the largest alpine lakes in the world. The pristine 72 mile circumferential shoreline and its picturesque surroundings attract multitudes of tourists desiring to vacation in an exquisite and exciting place. Together with a lot of sunshine and mild temperatures, hikers become very active during the spring and summer months in Tahoe. With trails nearly at every turn, vast exploration of the many summits surrounding the lake is possible, which present spectacular views deemed unbelievable. Desolation Wilderness and Emerald Bay Falls are only two of the famed places hikers delight. For the less proactive, sightseeing by car or tour bus is just as eventful. Towering peaks, cascading waterfalls, and mountainous, uninhabited terrain are all part of the scenic panorama. 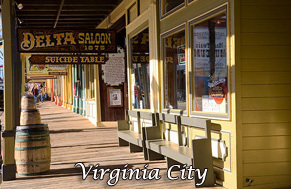 An escapade to the neighboring Virginia Range that’s adjacent to Carson City, Nevada, is well worth the effort if you enjoy historical landmarks and old west history, that which the infamous, old mining ghost town of Virginia City has to offer. When the winter season flourishes, tourism diverts to the slopes of world-famous Heavenly Mountain Ski Resort and the other dozen or so surrounding ski facilities. With Heavenly Mountain on the south shore, Squaw Valley on the north, and the myriad of others in between, skiers have a variety of choices of skiable terrain. 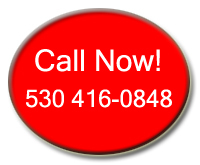 Golf courses abound in Lake Tahoe for those who enjoy being on the green, including the well-renowned Edgewood Tahoe where the American Century Celebrity Golf Championship takes place each year. It’s a plush place where the Albatross and Double Bogey players play on the same turf. Depending on your fancy, scores of other activities are readily available. Water skiing and parasailing provide a lot of summer fun along with camping, picnicking, miniature golfing, kayaking, shopping, and sunbathing, which you’ll have a large assortment of beautiful beaches from which to choose. 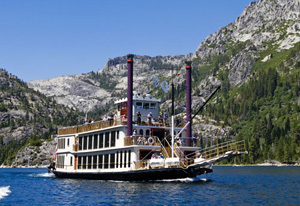 Another Tahoe attraction is the riverboat cruise across the lake. You can sail aboard either the MS Dixie or Tahoe Queen, both offering an awesome family adventure. There are practically no bounds to what you can do in Lake Tahoe. Vacationers thrive on the variety of choices they have, activities they can take pleasure in as a family or singly, if preferred. What’s more, even though some things change with the season, Tahoe is a year-round resort, which means that the Lake Tahoe fun and adventures can incessantly be enjoyed each and every day.